Comfort that risk <= than new and more schedule certainty to complete 5 more launches over next 8 months. Cost is better, but not driver. If you can get the acceptance of used as being just as good as new then SpaceX could then go to a set price for F9 regardless of whether the booster flown is new or used as long as the customer does not specify a new one. This is their current expressed pricing goal to occur as early as next year. So far the views released lately seem to support this view of used as being as good as a new one. I was reading an old book about the history of the integrated circuit. In passing it mentioned in the earl1950's, when companies were still making things like TV's and radios by hand soldering parts to each other people were saying that this was more reliable than these new fangled "printed wiring" boards. You really have to take a step back outside of the launch industry "Expendable is the only way to orbit" mindset and realize how crazy the "I want a new one that's never been flown before" request sounds. Every car/boat/ship/plane/submarine/helicopter has been through at least one full test of its ability to actually travel in the medium for which it was designed. The question is not wheather reuse is "good," it is wheather it's better than expendable, and not just for the mfg. "NASA’s interest in SpaceX’s reusable technology seems to be growing as well. Sources at Kennedy Space Center tell WIRED that NASA and SpaceX have preliminarily agreed to launch the next two cargo resupply missions to ISS atop reusable rockets." Sources at Kennedy Space Center tell WIRED that NASA and SpaceX have preliminarily agreed to launch the next two cargo resupply missions to ISS atop reusable rockets." Reusable not reused. Aren't all F9s boosters reuseable now? Not the ones that are launched without legs and grid fins. But it's hardly a surprise that the boosters launching the CRS missions have legs and grid fins. SpaceX offered SES the first reusable orbital rocket launch in aerospace history and all the free publicity that came along with it. The historic mission launched on March 30, and on October 11, SpaceX fired off its third reusable rocket, carrying another SES payload. So it’s clear enough what they mean, although using the correct word would help! Nearly everybody in the press is mixing up their terms (no surprise). All Falcons are potentially reusable. Not all of them are used that way. For WIRED to say that NASA is going to use "reusable" rockets is a bad choice of words. They should rather say that the rockets were previously used (which sounds like we're talking about a used car), or use SpaceX's phrase "flight proven". The only things not being reused on CRS-13 is the US and Trunk. With Nasa, SES, Iridium on board, and USAF probably not too distant in the van, majority customer acceptance is likely approximately one year after first reflight(3/30/2017). More than half of 2018 cores launched will be reflown cores. Which given SpaceX's demand and backlog, may very well be the difference between those customers flying in 2018 or not. Reusable sounds better - like it's following its intended path. Reused seems like a secondhand afterthought of lower quality. How many years until this is so commonplace the adjective gets dropped all together? We don't use it for flying on airplanes. We'll probably be living with the adjective for a good while yet. Most rockets are expendable, and they will remain so for the foreseeable future. As far as I am aware, the only other company planning reuse of an orbital-class first stage right now is Blue Blue Origin. They are aiming for a 2020 first launch of New Glenn, although as far as I know we don't have a more specific NET date. Even assuming they hit their goal, I doubt they will fly a re-used booster until 2021. ULA's Vulcan and ESA's Ariane 6 aren't even being built with re-use planned from the beginning, but more a situation of maybe-we'll-add-reuse-later-if-we-feel-like-throwing-some-money-at-it. Personally, I doubt we'll ever see SMART re-use on the Vulcan, and if re-use is ever implemented on Ariane 6 (either Adeline or something else), it will be a different enough vehicle they will probably call it Ariane 7. As for other foreign launchers, the Russians have been talking about reusing boosters all the way back to (at least) the Zenit first stages on Energia; however, they barely have the funding to keep their current program running and don't have the money to invest in developing reusables. Japan and India are in a similar boat to Russia in that they could probably develop the technology for re-usable boosters, but I don't see them spending the money. JAXA has been working on the H3 since 2013, and last I knew it's first flight had a NET date of 2020. India has expressed interest in reusables, but the amount of funding available for that project seems fairly limited, and their future Unified Launch Vehicle (which isn't even baselined for re-use, as far as I know) doesn't have a NET date. As for China, we saw a mock-up of a very Falcon 9-looking Chinese rocket a few months ago with landing legs, etc. Like Russia, Japan, and India, China could probably develop the technology needed for re-use if they wanted to, and they definitely have the money to invest if they decide to go that route. However, they already have a lot on their plate with beginning construction of their modular station, ramping up for more frequent Shenzhou flight, and ironing out the problems they've been having with Long March 5. Bottom line is that SpaceX probably has the re-usability game to themselves at least through the end of 2020, and we'll probably be referring to their rockets as re-usable and reused for a fair while yet. So the rocked correllary may be. There must be more examples/possibilities. At their flight rate and year-on-year acceleration, SpaceX demand and backlog are swapping positions. They will soon be able to launch all the payloads created world-wide -- backlog will be a satellite vendor issue, not a launch issue. 2018 is cross-over year (baring mishaps). Recall that ULA boss Bruno trash-talked predicted 12-15 months (IIRC) for return to flight after AMOS... that was 13.5 months (and 16 launches) ago. At 15 month point, he could be off be a mere 20 launches -- 3.3 years of Atlas V flights. And the Nose Cone (solar covers I count as part of each new trunk that has to be replaced anyways). A supermajority of marketable launches will soon be SpaceX launches, and they will be re-using their Block 5 F9s many times. Not only are you laughably wrong, within 1 to 2 years the majority of launches where national vanity or security are not the over-riding concern will be on returned boosters. When the BFR/BFS is in operation, almost all tons of material orbited as a percentage of tons orbited will be on systems intended from the outset for 100% re-fuel to refly systems. I stand by my previous post. One, regardless of SpaceX's commercial market share, most rockets - note that I did NOT say most launches - will be expendable well into the 2020s. Two, the chart you referenced does not take into account government launches. Three, SpaceX may have been awarded the bulk of commercial launch contracts for next year; however, those flights haven't launched yet, and it is foolish to count chickens before they hatch. Also, while SpaceX has had a great year in 2017 and I wish them only the best going forward, a failure or partial failure next year could easily interrupt their launch cadence for at least a couple of months. If that failure occurs on a first stage which is being re-flown, it could temper the speed with which the industry is willing to embrace reuse. I stand by my previous post. 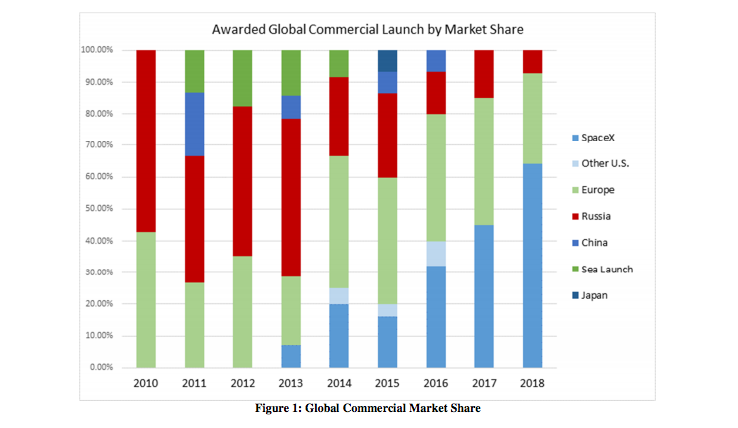 One, regardless of SpaceX's commercial market share, most rockets - note that I did NOT say most launches - will be expendable well into the 2020s. If you are counting Estes, then by a very wide margin so. Two, the chart you referenced does not take into account government launches. Three, SpaceX may have been awarded the bulk of commercial launch contracts for next year; however, those flights haven't launched yet, and it is foolish to count chickens before they hatch. I feel of that which isn't pathological skepticism amounts to your saying most sugar sold as such is in the form of tiny whitish cube like bits. It is true and utterly without meaning. So you argue, that because SpaceX reuses their first stages, they fly less rockets than others? They have more launches, but because of reuse, less rockets. Correct, but what is the point you are trying to make?